The heart is responsible for pumping oxygenated blood around our body so we can function normally. The human heart is a pump and it pumps blood around our body at different speeds and pressures according to the bodies needs, it is able to do this by contracting and relaxing as the wall of the heart is made of cardiac muscle. Human hearts usually beat between 60-110 times a minute. 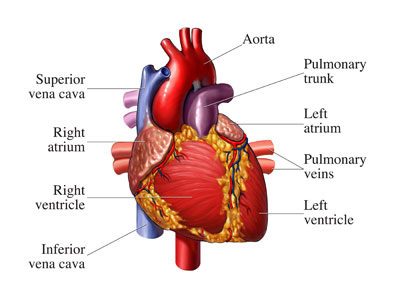 The heart is made up of four main chambers, separated by valves. The right atrium and the left atrium and the right ventricle and the left ventricle (as shown on the image above). Arteries carry oxygenated blood away from the body and veins carry deoxygenated blood to the heart.